Two fascinating assessments of TARP this morning. TARP is due to expire (collapse, wither, self-immolate, commit suicide with serrated knives) on October 3. No one is mourning its passage. An essay from The Guardian represents a Take No Prisoners approach, with Wall Street, Washington, and gulled media elites in cahoots to bamboozle the rest of the nation. Left wing Tea Party anyone? 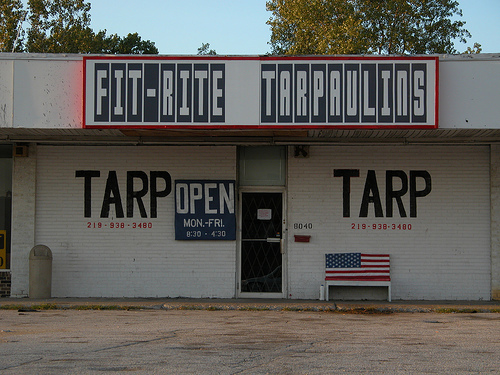 "TARP TARP" by Seth Tisue. Some rights reserved. The Guardian essay argues that TARP was a “blank cheque bailout” that only served the interests of Wall Street banks. Counter arguments for the program’s success in saving the national (and perhaps global) economy from financial collapse are specious at best, and repayment of the $700 billion (with a profit of $22 billion) is moot, because the system allowing Wall Street to game the rest of the world remains intact. While Wall Street “fat cats” (to coin a phrase) sit pretty, the rest of us are writhing and spinning. A Congressional Oversight Panel report, “Assessing TARP on the Eve of Its Expiration”, takes the measure of TARP with a bit less passion and far more precision, but in the end its conclusions are really not that different. The moral hazard issue – the idea that Washington favored the largest financial institutions and reinforced the belief that they are “too big too fail” – remains the biggest reason for public hatred of TARP. The COP report does not really challenge the idea that Wall Street played Washington with a heavily stacked deck because Ben Bernanke, Tim Geithner, Larry Summers, and key members of Congress were too close to the industry. Heads – Wall Street win. Tails – US citizens who don’t live on the Upper East Side of Manhattan or in Greenwich, Connecticut lose.